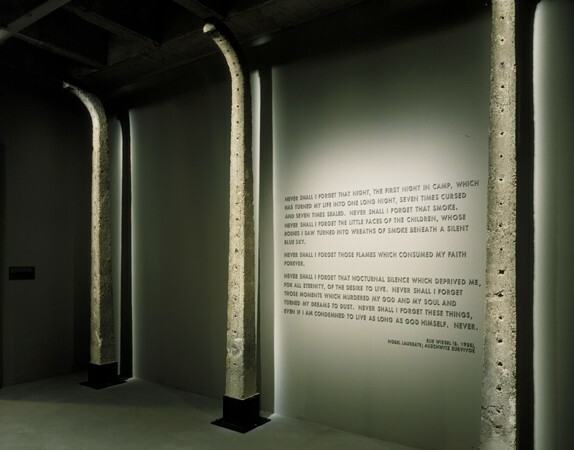 This photograph shows Auschwitz fence posts and a quote from Elie Wiesel's Night . They are on display in the third floor tower room of the Permanent Exhibition at the United States Holocaust Memorial Museum. "Never shall I forget that night, the first night in camp, which has turned my life into one long night, seven times cursed and seven times sealed. Never shall I forget that smoke. Never shall I forget the little faces of the children, whose bodies I saw turned ino wreaths of smoke beneath a silent blue sky. Never shall I forget that nocturnal silence which deprived me, for all eternity, of the desire to live. Never shall I forget those moments which murdered my God and my soul, and turned my dreams to dust. Never shall I forget these things, even if I am consigned to live as long as God Himself Never. "